Choosing the right furniture for your conservatory is a must if you're planning to entertain guests and make the most of this additional space in your home. There's a huge choice on offer but by selecting the best quality you can afford, you'll be enjoying your conservatory furniture for years to come. Investing in a furniture suite can be one of the best buys you can make for your conservatory. Select the best you can afford and enjoy it in your conservatory or garden. A high quality suite can be used both inside and out and double up for use as rattan garden furniture. The best conservatory furniture will be strong, usually with a metal aluminium frame, and very durable. A lighter weight suite will enable you to move your rattan conservatory furniture suite to make full use of it; both inside and also outside in a garden patio area for parties etc. This luxury suite comes from the Monaco range. The smart clean lines of this rattan garden furniture, along with the classic dark tones, are quite unmistakable. The modern conservatory furniture look achieved here would be very in keeping with any stylish home. 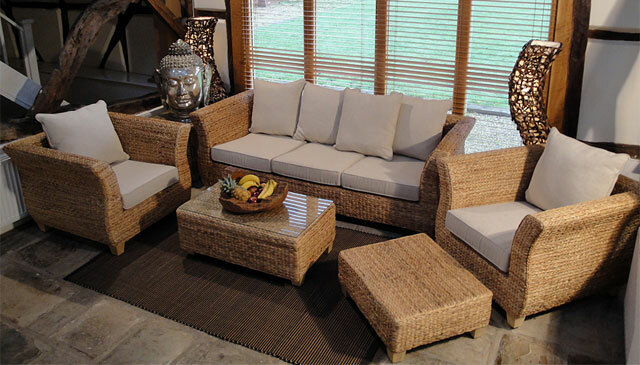 The Montana range comes in a beautifully natural lighter shade of rattan weave. The larger style suite is available also in a medium sized suite if space is at a premium. Taylor made rattan conservatory furniture needs to be durable, good looking and very comfortable. The Montana range fits the bill perfectly. The above rattan furniture sets are currently included in the conservatory furniture sale extravaganza. Sale can end at any time. If you're in need of a high quality furniture suite then look no further.